I know that today's post was supposed to be the 3rd and last in our Meal Planning mini-series. But this whole series was prompted by our own return to planning after an organized meal plan hiatus. I'm tweaking some things as we go and decided to finally get our recipes all in one place. The recipe binder is in the works and I'll be ready to share it, along with that final post on how we actually cook and execute our meal plan, on Monday. Want another broken promise? I've got you covered. Remember the really awesome lighting project I picked for this month's "Pinboard to Home" challenge? Yeah, it's getting bumped. Bumped to next month. My mom came in for a short visit over spring break. Whenever my parents visit, it's safe to say that some sort of project undertaking will happen in a serious way. They know that the numero uno reason we don't get projects done faster around here (which we wouldn't change for the world) is because of our littles. They like to help us cross off a big ticket item or something we would have a hard time doing at all without the help of some child entertainers. Since my dad couldn't make this trip, I suggested we keep any projecting to something small. Like taking apart and cleaning a chandelier (to make way for that new light!). My mom agreed, but once she arrived, the crazy project train was off and running. Our focus took a sharp detour from updated lighting, to a better functioning laundry/mud room. 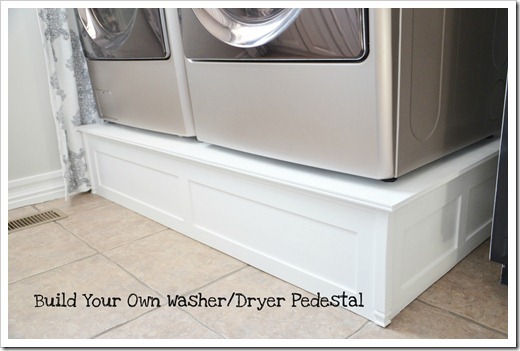 Specifically, a platform for the our washer and dryer. And one thing usually leads to another when we start something in our untouched spaces. If we were going to build a platform, then we better patch/paint the walls while the machines were pulled out, and address the broken chartreuse mini blinds with approximately 20 years worth of dust build up. So, as it stands today, we have the wood cut for the W/D platform, a freshly painted room, a newly organized pantry, and some hooks on the wall for jackets. We're hitting the road to visit family over Easter so we'll see if we can knock out the platform and a few other updates this weekend. And consider this the new official "Pinboard to Home" project for March. Hope you all have a great weekend!